John J. Berger, Ph.D. | John J. Berger, Ph.D. Author Archives: John J. Berger, Ph.D.
Posted on December 19, 2016 by John J. Berger, Ph.D.
Part 5 of a series on Rotterdam’s efforts to become a sustainable and “climate-proof” city. 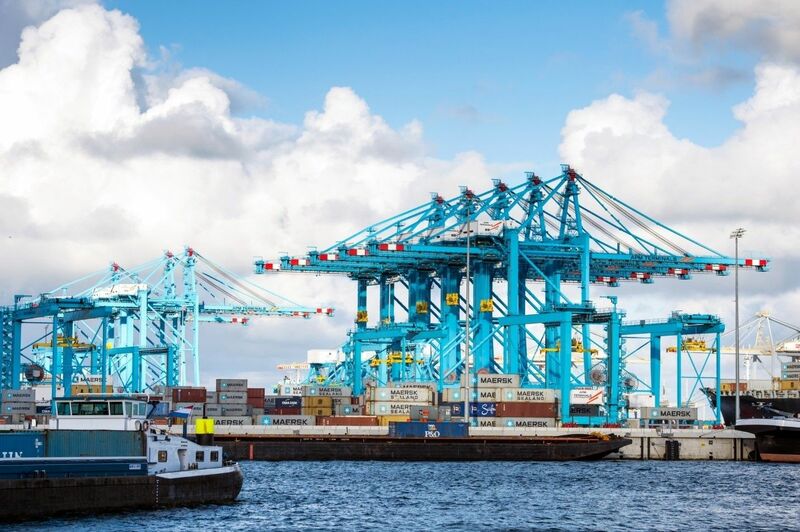 Rotterdam, The Netherlands— Rotterdam’s Port Authority has announced it intends the Port of Rotterdam to become Europe’s most sustainable and efficient port, despite a recent major increase in coal power production there. This will be a big challenge. The port is Europe’s largest by cargo volume and covers 48 square miles of land and water. Millions of tons of fossil fuels per year are transshipped from the port, and it hosts many energy-intensive industries. Among them are two legacy 500 MW coal power plants that have been operating since the late 1980s. While these two old power plants are scheduled to close by early 2017, two new and much larger coal power plants totaling 1,870 MW opened in the port in 2015. Together they generate 9.7 million tons of CO2 per year, about 50 percent more than the two older plants. That conflicts with the port’s stated environmental goals. “The Port of Rotterdam has the ambition of being the most sustainable port in the world,” the city’s Climate Initiative website notes. According to the port’s website, it is officially committed to reducing its CO2 emissions by 20% in 2020, 50% in 2030, and 80% in 2050. How this will be done is not clear. Ships berthed in the Port of Rotterdam with refineries and fuel storage tanks in the background. Most of the emissions reductions were supposed to have come from an experimental and commercially unproven technology known as Carbon Capture and Storage (CCS). While it had been used to reinject CO2 from Norwegian oil field operations, no largescale CCS had ever been proven to be technologically and commercially viable for a large coal-fired power plant. The larger of the port’s two new coal plants, Uniper-Maastvlatke 3, is a 1,070 MW coal plant that has a CCS unit, but it has not yet begun to operate and at best is only designed to capture 25 percent of the plant’s CO2 emissions. The other new coal power plant is not CCS-ready. In November 2006, the city and port’s International Advisory Board, comprised of business leaders, advised the port and the industry operating there to begin taking action to insure their economic future and seize potential economic opportunities by transitioning away from fossil fuels. The message was reinforced in a visit to Rotterdam by former President Bill Clinton in December 2006. The city took note and in May 2007 adopted the Rotterdam Climate Initiative, pledging to cut the city’s carbon emissions in half by 2025. Despite warnings from environmental researchers about the risks of depending on unproven CCS technology, city and port officials allowed the two new coal plants to be built on the theory that their emissions would be trapped by CCS and reinjected into depleted oil and gas fields beneath the North Sea. The port’s commitments to steeply reduce emissions and the reality of its rising emissions are now sharply at odds. In the wake of disillusionment about the availability of cost-effective CCS technology, Rotterdam—to environmentalists’ chagrin—recently abandoned the Rotterdam Climate Initiative’s much-vaunted official commitment to reduce its carbon emissions 50 percent by 2025. Political opponents have attacked the Initiative for investing municipal funds to address global issues. Instead, they contend that investment should be restricted to cost-effective measures that produce tangible benefits for residents, such as cleaner air, lower energy bills, less noise, and flood protection. CCS has not as yet been shown to be commercially competitive in the power industry, nor has it been proven at the large scale needed to capture all the emissions of a large coal power plant. Significant amounts of a thermal power plant’s energy are required to compress and store its CO2 emissions and subsequently transport and monitor them indefinitely to prevent their leakage or other release from storage. Another problem is that CCS technology typically does not capture all of the emissions a thermal energy plant produces, so some greenhouse gases are released. The port does have plans—subsidized by hundreds of millions of euros of public funds—for a two-year CCS pilot project in which a quarter of Uniper-Maastvlatke 3’s emissions will be sequestered using a regional CCS pipeline now being developed. Known as the Rotterdam Capture and Storage Demonstration Project (ROAD), it is one of the world’s largest CCS demonstration efforts and is designed to link industries producing lots of CO2 to potential offshore CO2 storage facilities. In addition to the challenge of its coal power plant emissions, the Port of Rotterdam has the largest terminal for coal and iron ore in Western Europe. Millions of tons of coal are transshipped from here every year, and fossil fuels still account for half of all the port’s cargo. The port is home to natural gas terminals, chemical and petrochemical companies as well as many other industries. Nonetheless, Rotterdam is actively trying to position itself for the inevitable end of the fossil-fuel era, according to port’s Director for Energy and Industry Nico van Dooren. Van Dooren projects that the port will reduce its reliance on fossil fuels in the future. Currently, however, the port’s modest sustainability efforts are largely focused on improvements in energy efficiency and reuse of materials and wastes by companies in the port, as well as co-firing some biomass in a coal plant. The port also has 200 MW of installed wind power and much smaller solar generating capacity. Officials at the port recognize that these current measures, however, are not yet enough to make the port sustainable. Wind turbines behind gates of LNG Terminal at Maastvlatke, Port of Rotterdam. 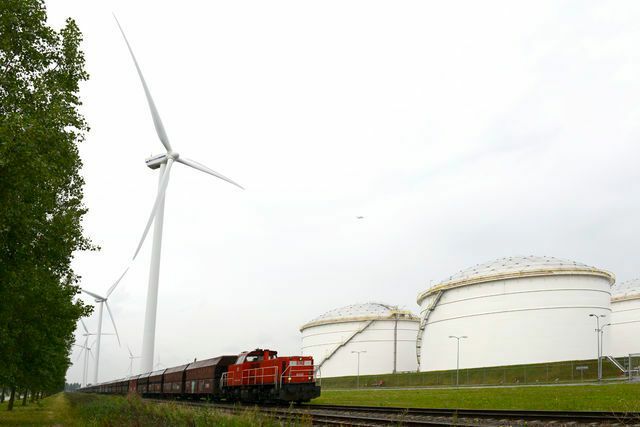 The port’s business coalition also has called on the Netherlands’ government to accelerate the nation’s transition away from fossil fuels to renewable energy. Its October 25, 2016 declaration urges the government to create a long-term policy framework that will lead to an 80-95 percent reduction in the country’s greenhouse gas by 2050 (compared with 1990) and create legislation to implement the Paris accord. To further ensure national energy policy cohesion, the coalition also urged that the post of minister for economy, climate and energy be created and that a national investment bank be set up to support innovation and major energy projects. Wind turbines and Kuwaiti oil tanker Al-Yarmouk at the Port of Rotterdam’s Calandkanaal. The forthright and unprecedented demand for more effective climate action comes as the Netherlands lags other European nations in moving toward clean energy. The nation today is dependent on fossil fuels for some 94 percent of its energy. Rotterdam is one of the largest sources of CO2 in Europe, similar to the heavily industrialized Ruhr region in Germany. The port is a huge contributor to the city’s economy and adds more than €14 billion in direct value to the Rotterdam region. Companies in the port directly employ over 94,000 people, and the port stimulates €2 billion of investment annually into the city’s economy. 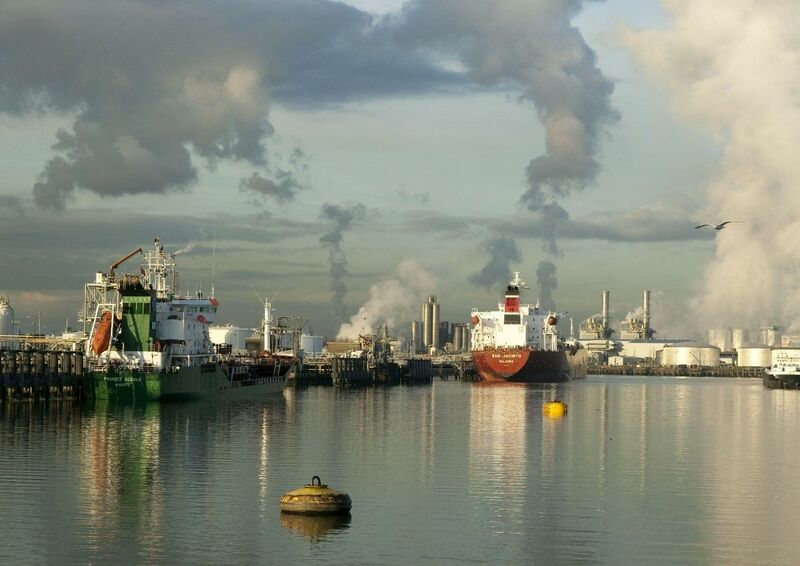 But in so doing, the port’s industries produce nearly 90 percent of Rotterdam’s CO2 emissions. 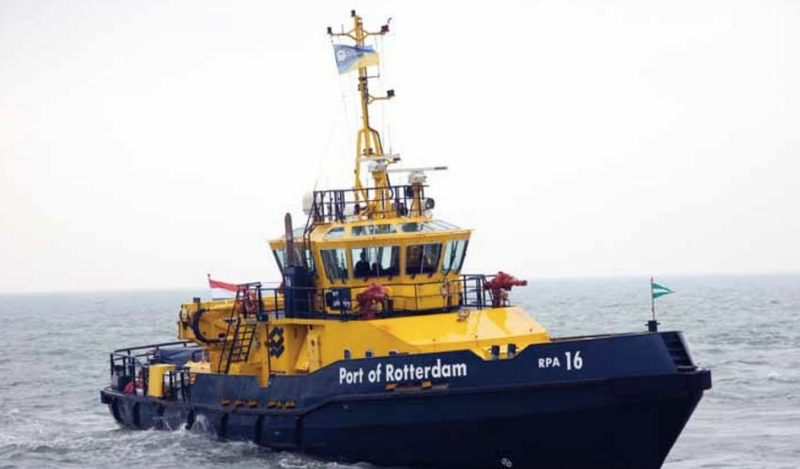 A hybrid diesel-electric tugboat, E-Kotug, being tested by Port of Rotterdam in an effort to reduce shipping emissions and improve and air quality. It would be challenging enough to curtail the port’s emissions if the port were not also growing. But the port is nearing capacity. The number of ocean-going ships docking at Rotterdam is expected to rise from 31,000 a year in 2006 to 57,000 in 2033 while the number of inland vessels will increase from 28,000 currently to nearly 70,000. The Port Authority therefore is currently completing a new deep water harbor and industrial area called Maasvlakte 2, on land reclaimed from the North Sea, at a cost of nearly €3 billion. The port describes the Maasvlakte 2 expansion on the Rotterdam Climate Initiative’s website as a part of its sustainability transformation. “By breaking new ground in the way it operates, which includes the development of the Second Maasvlakte, the port of Rotterdam wants to be at the forefront of sustainability and accessibility,” the website states. The Port has set environmental requirements for companies wishing to locate at Maasvlakte 2. These criteria cover air quality, noise, energy efficiency and reuse of waste heat and materials as well as use of cleaner transport inland beyond the port. This October, a company called Sif that makes masts for offshore wind turbines opened a new facility at Maasvlakte 2. “Maasvlakte 2 gives us the capacity to accommodate these new developments,” a port spokesman said. The Maasvlakte 2 container terminals are also fully electric, with the terminal of APM Terminals entirely powered by wind turbines. Meanwhile the Rotterdam World Gateway buildings are equipped with thermal energy storage. Maasvlakte 2 has been accepting tenants since 2013 and will eventually more than double Rotterdam’s container capacity while providing more space for chemical and distribution industries, as well as for large-scale container storage. The expansion thus makes it imperative for the port to find ways to reduce air pollution and CO2 emissions. Royal Dutch Shell operates one of Europe’s largest oil refineries in the port of Rotterdam where it processes 450,000 barrels of oil a year. It will contribute waste heat to district residential heating and to a heat storage complex. About 300,000 tonnes of pure CO2 produced here and at Alco Energy’s biofuels plant is sent to the Westland area north of the port where it is used as a nutrient to increase plant productivity in the area’s large greenhouse district. By getting the CO2 from the port, market gardeners reduce their natural gas by 95 million cubic meters a year and their CO2 emissions by 170,000 tons. (Natural gas would otherwise be burned to produce CO2 to stimulate plant growth.) But the CO2 produced and sent to the greenhouses is not permanently sequestered. Exxon, too, has a major refinery in the port and plans to invest $1 billion in producing lower sulfur fuel and in increasing the refinery’s energy efficiency. BP also has operations in the port. As one indicator of the hazards that large concentrations of fossil fuels can present, BP offices are behind an earthen berm that serves as a blast deflector. Apart from its planned pilot carbon sequestration efforts, the port is striving to increase the production of renewable energy by expanding its wind and solar production and by increasing the efficiency with which energy is used in the area. Klosterboer, a large cold storage and distribution company at the port has installed an 1,800 panel rooftop solar system capable of producing 430 MWh of power annually and installing wind turbines. By 2023, several companies plan to have a total of 4,450 MW of wind power in the Dutch part of the North Sea, according to a port spokesman. Meanwhile on land, energy-conscious Klosterboer is the first cold storage firm to receive a Lean & Green award. Its automated warehouses use 37-45 percent less power than conventional warehouses. The company also uses energy-efficient LED lighting throughout its facilities and received a BREEAM-NL three-star certification for the construction of its new terminal. Europe’s largest renewable biofuels plant operated by Neste Oil in Rotterdam’s harbor and industrial area. Neste is currently building a € 60 million biopropane production unit that is expected to be operational by 2017. LyondellBasell, one of the world’s largest plastics, chemicals, and refining companies and a port tenant, is entering the biofuel business by making ETBE (ethyl tertiary butyl ether) from plant oil feedstock. Plant-based fuels have the potential to reduce net carbon emissions because their carbon has been extracted from the atmosphere by the plant during photosynthesis. Thus if their carbon emissions are captured and sequestered, a drawdown of atmospheric carbon can in theory occur. 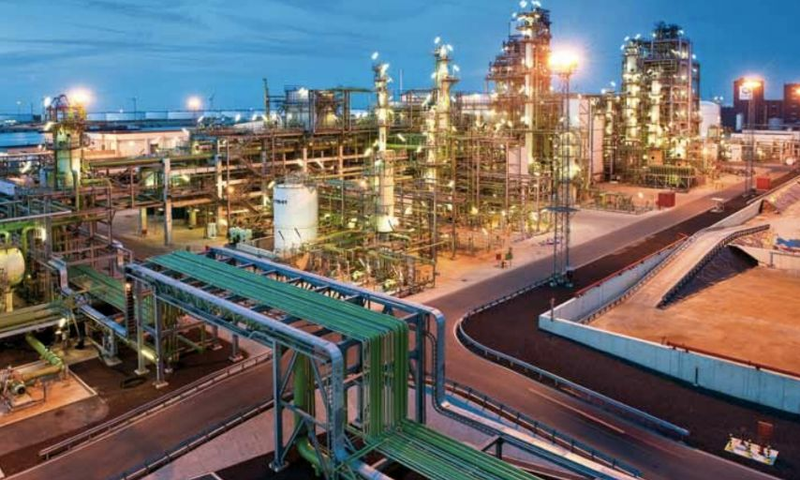 Another port tenant, Alco Energy (formerly the now-bankrupt Abengoa, the Spanish renewable energy and desalinization[NPG1] company), is engaged in manufacturing corn ethanol at its Rotterdam plant. To reduce the emissions of barges sailing from the port of Rotterdam to the hinterland of Europe and the emissions of vehicles driving in the port complex, the port has built an LNG terminal where LNG is gasified with the help of waste heat from the port’s new Uniper coal power plant.. According to a port spokesman, vehicles in the port will at some point be able to run either on LNG, renewably generated hydrogen, electricity, or by using hybrid electric propulsion. Currently, only a few inland barges and some cruise ships are using LNG, as it is more expensive than other fuels. “But as it is much cleaner and produces less CO2,” port spokesman Sjaak Poppe said. “We think LNG is important as a transition fuel, especially for shipping in the next decades,” he added. In an effort to increase the production of renewable energy, the port is planning on raising its wind power capacity to 300 MW and is conducting an experiment with a small floating solar power plant. According to a port spokesman, the lake where the experiment is taking place has space for 400,000 panels. That would be able to produce enough energy for 25,000 households. To further reduce the port’s reliance on fossil fuels, the port is also encouraging companies that produce biofuels to locate in the port. Neste, SkyNRG, and KLM are cooperating to jointly produce biofuels for aviation in the port. Neste itself produces 1 million tonnes of biofuels annually in Rotterdam, not all for aviation fuel. Neste is trying to get KLM to adopt its biokerosene aviation fuel as a 1 percent blend in all KLM’s jet fuel. Although these quantities are small relative to global demand for aviation fuel, the effort is important because it is currently the only viable alternative to fossil fuel-derived kerosene. Despite the totality of all efforts made to date by individual companies, the port from 2005-2012 merely held its CO2 emissions constant and made little progress in ramping up renewable energy production. Over the past four years, however, there the port’s wind capacity has increased significantly and the port is planning to provide 14 percent of its power from all renewable sources by 2030. Posted on December 1, 2016 by John J. Berger, Ph.D.
Rotterdam, the Netherlands— Can the city of Rotterdam cut its CO2 emissions substantially by 2025 and become 100 percent climate-proof by then? The city aims to achieve the climate-proofing goal by altering its dikes and public spaces while creating more flood-resistant housing. Rotterdam’s industries and incinerator generate enough waste heat for a million households. This city of 630,000 thus has substantial potential for district heating to share residual industrial heat with homes and businesses. A company known as the Heating Company of Rotterdam collects heat from industries in the port and shares it with homes and businesses. 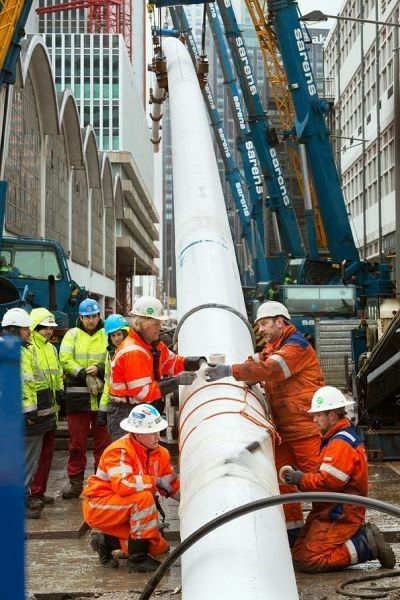 Installing underground piping for Rotterdam’s district heating system. Slightly less than 20 percent of Rotterdam’s homes are now on district heating. The city is committed to getting 40 percent of its residents on district heat by 2020 and aspires to have 50 percent connected to district heating by 2035, but that will be very challenging. The use of district heating is integral to Rotterdam’s plan to eventually phase out natural gas and reduce carbon emissions. Its district heating system already avoids the emission of 182,000 tonnes of CO2 per year. To reduce natural gas, the city wants to increase the use of electricity for domestic residential uses and to use more rooftop solar panels. How The District Heating System Works. Heat produced by the city’s waste incinerator and waste heat generated by industries in Rotterdam’s port area is used to heat water. The hot water is then sent in underground pipes to provide homes, businesses, and institutions, such as hospitals, with reliable and affordable space heat and hot water. 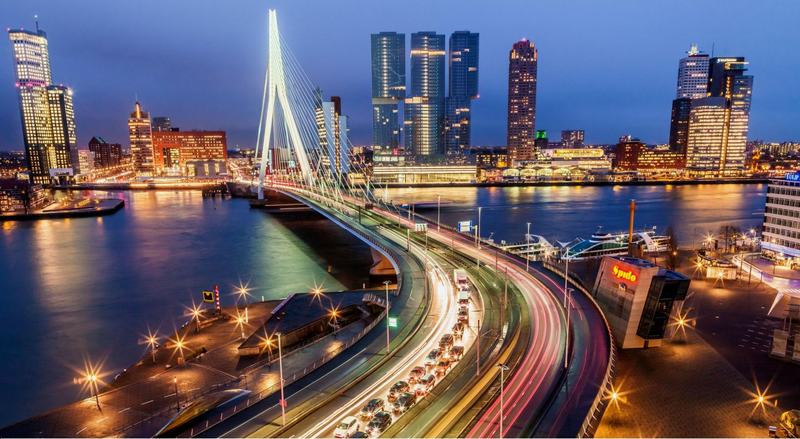 Rotterdam’s district heating will be part of a larger project called The Heat Roundabout that will also include the city, its port, and the other municipalities in South Holland, such as The Hague, Delft, Westland, and Leiden. The city is investigating the possibility of making the heating network more sustainable by integrating geothermal heat into the system. Homes and Greenhouses By 2020, 350,000 homes will be connected to district heating along with about 2,500 acres of greenhouses in Westland and Oostland north of the port. The cost of building the district heating infrastructure has been about three billion euros. However the system will generate about twice as much in revenue from sales of the heat plus the value of the CO2 reduction and other social benefits. 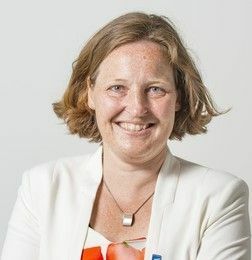 Astrid Madsen manages the city’s district heating and cooling program and other aspects of Rotterdam’s energy transition. Under a provision added to the Rotterdam Building Act in July 2007, if district heating is available in a part of the city where a new building is being built, the building must be connected to district heating. Astrid Madsen, Manager of District Heating and Cooling System. Challenges and Partnerships “New buildings are not the challenge, existing buildings are,” Madsen said. Eighty to ninety percent of the buildings in Rotterdam in 2050 are already built, she points out. 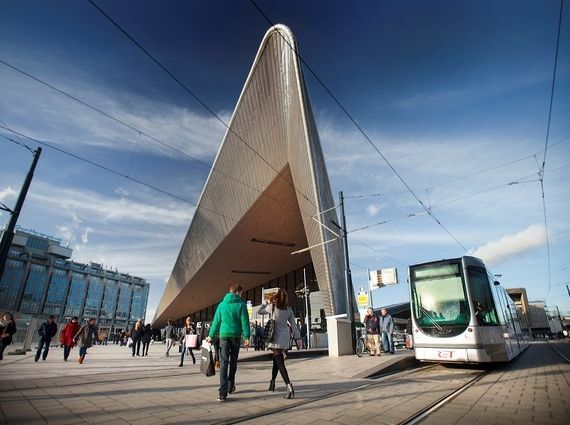 Transport and EVs Rotterdam’s public transport company, RET, currently uses clean renewable energy to power its trolleys and subways, and RET aspires to become the world’s cleanest public transportation company. It plans to extend vehicles’ range by capturing and reusing braking energy, a process known as recuperative braking. Electric tram stop in front of Rotterdam’s Central Railway Station. Through its Power Surge Program, Rotterdam is also strongly encouraging the use of electric cars, which reduces noise, carbon emissions, and fine airborne particles that damage people’s lungs. “We’re right in the middle of implementing a huge zone where polluting cars will no longer be allowed after January 1 ,” said Paula Verhoeven, manager of the Rotterdam Climate Initiative. At the same time that the city is introducing its environmental zone, it is also encouraging demand for electric cars. “If you have an electric car, you get a charging point for free from the city,” Verhoeven said. “We also have a subsidy in place to [encourage people to] replace their old car, buy a new one if they like, or they can get rid of their car altogether and just use public transport, which is excellent in the city,” Verhoeven said. 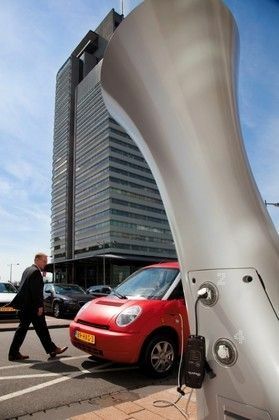 One of Rotterdam’s new electric vehicle charging stations. Biodiesel fuels are being introduced for trucks and natural gas is being tried for inland ship traffic. Deltalinqs Energy Forum, a project of the city’s main business association, is assessing the possibility of using hydrogen for vehicles at Port terminals and to fuel medium-sized, inner-city delivery vans. Europe’s largest renewable biofuels plant operated by Neste Oil in Rotterdam’s harbour and industrial area. Municipal Programs Education. The city is committed to strengthening environmental education and participation in sustainability activities. The city operates on the premise that sustainability must be a guiding principle in education and research. The city thus brings sustainability issues to the attention of its colleges and universities and encourages a greater focus on sustainability issues in higher education curricula. The city runs a nature and environment education program for primary school children supported by a network of children’s farms, as well as nature and environmental education centers with gardens, to bring children into contact with plants and nature. “Adults who were taught about nature and the environment when they were young better appreciate the value of nature, the environment and sustainability and are consequently better able to make considered choices,” according to a major city sustainability report. Second of a five-part series on Rotterdam’s efforts to become a sustainable and “climate-proof” city. REVISED AND UPDATED, 11-11-16. Rotterdam’s modern skyline with world famous Erasmus Bridge at left and the massive De Rotterdam building, left of center. Rotterdam, the Netherlands—Rotterdam, a Dutch city of about 630,000 in a low-lying delta on the North Sea, has a set of ambitious long-range plans to become sustainable and climate-proof. These broad and consequential plans involve billions of euros in investment and the management of the city’s energy, water, land, raw materials, and waste. The plans’ implementation will impact the city’s air quality, public health, mobility and transport, outdoor public spaces (including parks and gardens). It will also influence the city’s biodiversity, building energy use, construction and even demolition. The city’s efforts are founded on extensive public outreach to engage all major segments of Rotterdam in the sustainability and climate-proofing campaign, from ordinary citizens and shopkeepers to major industries. To stimulate and facilitate a rapid transition to clean energy, the city government is striving to remove obstacles to sustainability. The city’s executive committee, meanwhile, is trying to attract funding from the federal government and the European Union to create optimal conditions for new investment. The executive committee also lobbies for needed legislation and infrastructure funding and seeks to create partnerships that advance sustainability with all segments of Rotterdam society. Therefore, the committee reaches out to companies, associations, major institutions, housing authorities, and groups of residents. At the same time, the city government is also consciously trying to make its own operations sustainable and to serve as a role model for the rest of the city. Thus it has adopted sustainable development guidelines, sustainable purchasing practices, and is operating the city’s property and vehicles as sustainably as possible. Operation of city swimming pools, for example, is being made more energy efficient through energy performance contracts with service providers who modernized the pools at no cost to the city. They are paid out of the energy savings that result. The city’s sustainable development guidelines require that, in addition to being energy efficient and “climate-proof,” all new developments must lead “to a more child-friendly, greener, cleaner, and healthier environment,” creating present value while leading to future benefits. A common theme I heard in talking with city planners was their determination to discover economic and quality-of-life opportunities for the people of Rotterdam as the city goes about the challenging long-term work of reducing greenhouse gas emissions and protecting inhabitants from rising seas and extreme weather. The Climate Initiative The Rotterdam Climate Initiative (RCI) is the municipality’s primary tool for guiding the city toward its climate goals. 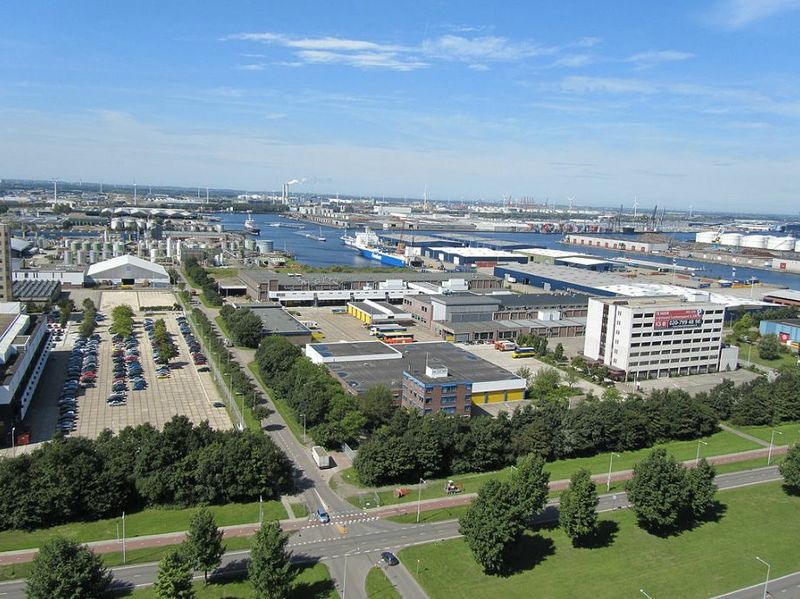 The RCI is a voluntary collaboration of the city, its environmental agency (DCMR), the Port of Rotterdam, and Deltalinqs (the umbrella association for Rotterdam industry), all working together toward a sustainable city and port. The Initiative factors in the interrelationship of climate, energy, water, people, the environment, and the economy in its comprehensive effort to tackle both the causes and the effects of climate change. Although 85 percent of Rotterdam’s greenhouse gas emissions comes from industry, industry played a leading role in developing the RCI. 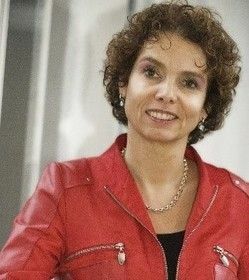 Thus early support for climate action in Rotterdam came from a coalition called “Together,” formed in 2006 by the city, its port authority, Deltalinqs, and DCMR. According to Paula Verhoeven, RCI’s manager, the impetus for the coalition came from the Clinton Foundation’s Climate Initiative. The RCI is based on rigorous scientific and technical research done under the Netherland’s “Knowledge for Climate “ and Delta research efforts. The planning process was based on an understanding of the likely physical impacts of climate change on the city and how those impacts would affect its operation. The 100 Resilient Cities Network Since 2014, Rotterdam has been an active participant in the 100 Resilient Cities network, launched and funded by the Rockefeller Foundation in order to develop “a roadmap to resilience” for Rotterdam and other participating cities. The network thus seeks to improve cities’ preparedness for flooding, heat waves, and other climate impacts. As part of that mandate, the network tries to strengthen local leadership capacity and to both protect and strengthen critical cyber infrastructure. If engineered structures survive a climate disaster but are inoperable because of a computer network failure, services will nonetheless be interrupted. Although the city isn’t talking a lot to the public about CO2 anymore and has relinquished its official commitment to cutting heat-trapping CO2 emissions in half by 2025, it is still committed to simultaneously “climate-proofing” the city and the region. 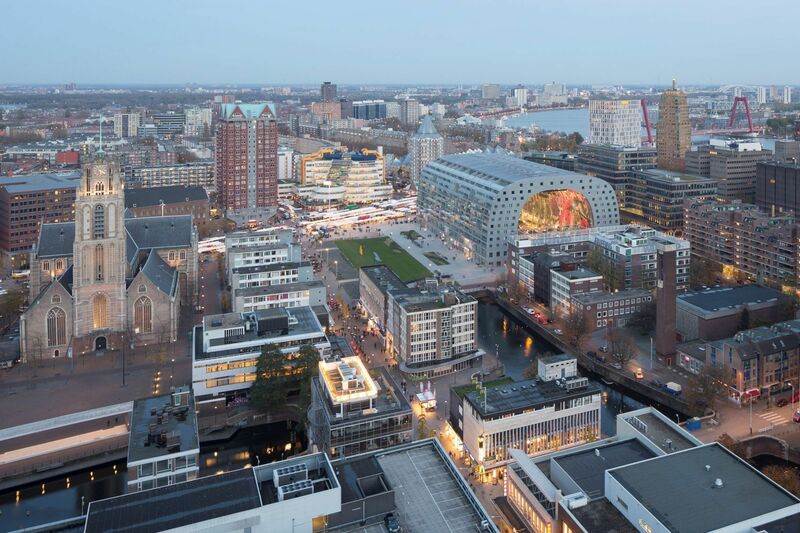 The RCI’s overarching purpose is not only to make Rotterdam more prosperous, attractive, and sustainable, but—through a component Climate-Proofing Programme—to fully protect the city physically from the impacts of climate change. The Rotterdam skyline with Erasmus University in the foreground, as seen from Brainpark Rotterdam. 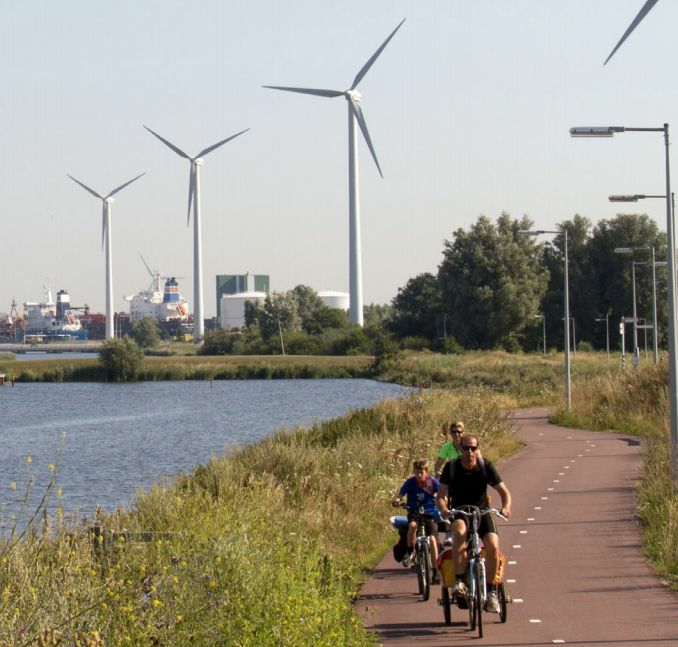 In addition to Rotterdam’s role in the 100 Resilient Cities Network, Rotterdam also belongs to the C40 group of cities and is a leader in the Connecting Delta Cities network inspired by the Clinton Climate Initiative. The Delta Cities network’s goal is to exchange knowledge about water management, climate adaptation, and sustainable development among cities globally. First of a five-part series on Rotterdam’s efforts to become a sustainable and “climate-proof” city. REVISED AND UPDATED, 11-11-16. Evening view of Rotterdam skyline and waterfront with the suspension cables of the city’s emblematic Erasmus Bridge illuminated against the sky. 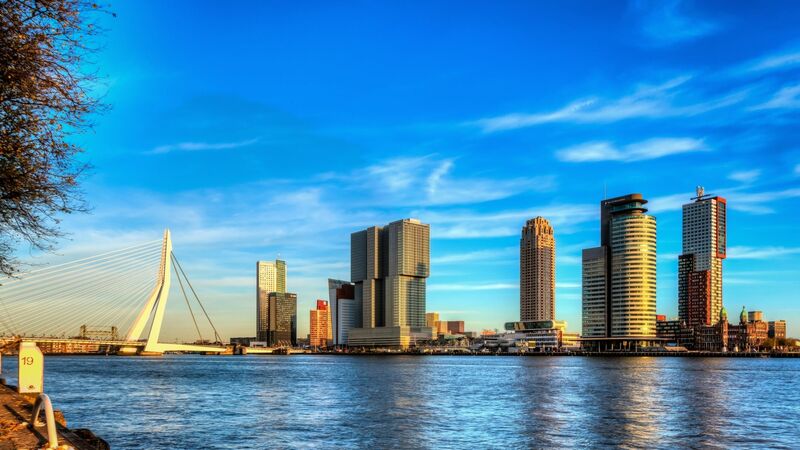 Rotterdam, the Netherlands—Although it is committed to reducing its greenhouse gas emissions, Rotterdam—the Netherlands’ second largest metropolis—no longer tries to rally the public behind its carbon dioxide reduction goals. “It’s a very deliberate political decision,” said the city’s climate program director, Paula Verhoeven. The city focuses instead on air quality, noise pollution, energy efficiency and other measures of sustainability. “There is no target on CO2 emissions at the moment,” Verhoeven stated. “When you talk to the public about CO2 emissions,” she said, “it doesn’t appeal very much. . . it’s very abstract.” Instead, the city talks about making its buildings, industries, and transport systems cleaner and more energy efficient. “Of course,” added Verhoeven, “we do have a target on all these other things that we do, and we thereby reduce our level of CO2 emissions. The city is endeavoring to create a low-carbon economy by focusing on three sectors: industry, the built environment, and transportation. The city’s industrial sector is currently CO2-intensive and in 2010 produced 88 percent of the city’s CO2 emissions. Before the city opted to stop highlighting its CO2-reduction goals, its plan was to cut CO2 emissions 50 percent below 1990 levels by 2025. The achievement of that ambitious goal, however, was predicated on the viability of an experimental and commercially unproven technology known as Carbon Capture and Storage (CCS). Despite warnings from critics that the technology was immature and risky, city officials allowed two new coal plants to be built in the Port of Rotterdam on the theory that their emissions would be captured and reinjected into depleted oil and gas fields beneath the North Sea. But the technology is not operating and experts have concluded that the Rotterdam Climate Initiative’s CO2 goal will not be achieved. To do so, the city would have to reduce its CO2 emissions by 17.5 million tons a year, according to a study on CCS and the initiative. The city’s pilot CCS project, however, is currently designed to only capture 1.4 million tons a year, according to data from the port of Rotterdam. Faced with the slow and uncertain roll-out of CCS technology, the city has abandoned its carbon reduction commitment. The combination of the city’s concentration of energy-intensive industry and the presence of empty oil and gas fields just offshore in the North Sea is ideal for a major CCS demonstration project. A consortium of 11 Rotterdam businesses is developing a regional CCS pipeline that will link industries producing lots of CO2 to potential offshore CO2 storage facilities. Known as the Rotterdam Capture and Storage Demonstration Project (ROAD), it is one of the world’s largest CCS demonstration efforts. Rotterdam might be said to be a city that “makes no little plans.” Its goal is to be the most sustainable port city of its kind—pleasant, safe, and healthy, with a flourishing economy. Modern architecture of Rotterdam’s Binnenrotte neighborhood including the city’s new market hall. According to the mayor and vice mayor, this vision of next-generation Rotterdam, “fits in with what many of the people of Rotterdam consider to be the most important motivation in their lives: a better future for their children and grandchildren and for future generations. To learn more about how Rotterdam is executing its long-range climate change and sustainability plans, see parts 2-5 of our ongoing series of articles on the city’s sustainability efforts. Posted on August 31, 2016 by John J. Berger, Ph.D.
Amsterdam, The Netherlands—For the past nine years, a Dutch cooperative wind power project in Amsterdam has been stalled by regulations imposed by political opponents. The project was initiated in 2007 by local co-op Onze Energie along with venture partner NDSM Energy and other wind co-ops. It would be the largest project involving Windvogel, a democratically run citizens’ wind energy co-op of 3,300 members. If successful, the project could supply enough power for thousands of Amsterdam households and all 400 companies on its proposed location, Amsterdam’s NDSM Wharf. After nine years of collaborative effort, the coalition has learned how time-consuming the planning and political process for wind energy development in the Netherlands can be. In addition to meeting national environmental regulations, the project, like other wind farms in North Holland, has to meet stringent and, some would say unnecessary, additional provincial statutory requirements. The province requires that wind farms must consist of at least six turbines, each sited at least twice as far from residential areas as national laws require. For each new wind turbine, developers must also buy and retire two old turbines. Although NDSM Energy and its partners cannot meet all the provincial statutory requirements, the co-ops have decided to seek an exemption from these regulations and apply for a license anyway, with the support of the Amsterdam city council, which owns the proposed project site. In May 2016, NDSM representing itself and its citizen co-op alliance, submitted a license application for its 15 MW wind project near the NDSM Wharf. Provincial authorities later reversed the permit, claiming jurisdiction over wind projects on their territory. According to Pater, the province has blocked NDSM from building a turbine for which it had strong local support, a city permit, and federal subsidies. The turbine would have been the first of the six-turbine NDSM-Windvogel project. Four of the project’s turbines would be sited along a highway near NDSM, and two would be along the waterfront. This experience exemplifies the difficulties that citizens of the Netherlands have encountered in trying to help the nation meet its clean energy goals. NDSM, joined by the City of Amsterdam, took the provincial government to court last November. The Environment Department for the North Sea Canal Area is currently reviewing the Amsterdam Wind and NDSM application along with others, and the province expects to issue its first licenses in 2017. Fourth of a four-part series on Amsterdam’s efforts to become a more sustainable city. Westhaven, Amsterdam’s western harbour area. Image by JVHERTUM. Amsterdam, The Netherlands — Change is coming to the Port of Amsterdam. The Port is seeking to become one of Europe’s most sustainable ports. Competing ports are modernizing and these days, that means reducing their environmental impacts. So Amsterdam must do the same to remain competitive. The Port is part of the World Port Climate Initiative, which launched in 2008 when 55 ports from around the world signed the World Port Climate Declaration at the encouragement of the C40 Climate Cities Leadership Group, with support from theClinton Climate Initiative. Amsterdam is the fourth busiest port in Europe in cargo tonnage, has 350 employees, and an annual investment budget of €10-15 million. More than 2,000 companies use the port every year and generate €6 billion in revenue. Companies in the port area employ 55,000 people. The Port is thus not only of substantial economic importance to the city of Amsterdam, but to the Netherlands as well. Like every major world port, Amsterdam has many opportunities to reduce its greenhouse gas emissions (GHGs). According to the port’s Vision 2030 statement, the port seeks to become “an innovative hub for [an] energy transition [and a] circular and biobased economy,” that will create jobs, new products and value-added, in partnership with the surrounding community. Jan Egbertsen has worked at the port for 20 years and previously was responsible for energy transition-related business development. Now he is the port’s project manager for innovation logistics business development. So the port is now reducing its CO2 emissions, reusing materials (read: creating a circular economy), generating and cogenerating clean energy, and implementing the aforementioned biobased and circular economy. The port therefore now functions not only as a catalyst for green development, but as an incubator, funder, innovator, research and development entity, and business partner for sustainable enterprises. Private companies have installed 65 MW of wind power in the port area, making it one of the largest onshore wind power parks in the Netherlands. The port is hoping to reach 100 MW of capacity in the next two to three years. A project team has been working with the Port Authority on developing new windmills as well as upgrading older models since 2015. The port plans on increasing wind production from 64.2 MW to 100 MW. Image by Port of Amsterdam. Because the wind park sometimes produces more power for the grid than the market demands, the port is studying the possibility of using surplus wind and solar power to generate hydrogen for buses and is exploring other methods of energy storage, including flywheels and batteries. Under the Netherlands’ national grant program for sustainable energy known as SDE+, wind energy producers receive federal price support for 12 years in the form of a guaranteed minimum price for each unit of energy produced. 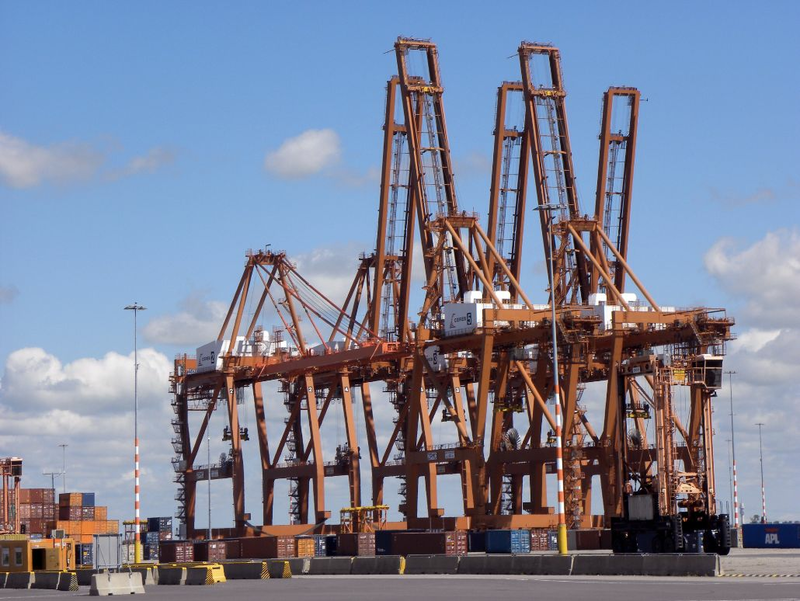 Support for projects at the port can come from the Amsterdam Climate and Energy Fund, from North Holland’s provincial Sustainable Economy Funds, and from the port’s own funds. As a facilitator of green development, the port is working with the city’s local waste incinerator, water company, and sewage company to produce renewable energy in the form of biogas. All the firms are sited within the port’s boundaries. The Amsterdam Waste Incineration Plant currently cogenerates heat and power from the city’s municipal refuse. The power is fed into the grid, and the heat is used for district heating. The Amsterdam waste management company AEB converts 99 percent of the 1.4 million tons of municipal and industrial waste it receives annually into sustainable energy and raw materials. Image by AEB Amsterdam. The port currently leases space to Orgaworld, a company that takes in fruit and fatty waste from restaurants, groceries, and other businesses to make biodiesel fuel. The port is also home to two other bioplastics companies: Plantics and Avantium. Plantics is conducting research with the University of Amsterdam to make biodegradable bioplastics. Avantium, a spinoff of Shell Oil, in partnership with Coca-Cola, is using bacteria to produce lactic acid from CO2 and sunlight for non-biodegradable biobased bottles. Years ago, ports used to function primarily as landlords providing space for companies to conduct their industrial activities, Egbertsen explained. Now, however, modern ports, can be innovative and proactive. The Port of Amsterdam thus increasingly sees itself as a prospective matchmaker capable of bringing together companies active in the biobased economy and that handle biomaterials with start-ups that have innovative new biobased technologies. Therefore the port in the future conceivably might be interested in developing a project, such as a biomass power plant, in partnership with companies who want to produce bioplastics. To nurture still more new green technology companies, the port has just opened a new incubator known as Prodock that provides start-up companies in energy, biomaterials, and the circular economy with space to operate pilot plants. In a circular economy, economic processes are planned and designed to operate without waste or pollution so that neither biological nor inorganic materials used are wasted. After use, the biological materials flows can ideally be safely returned to the environment or reused as feedstock in another production process. Similarly, engineered materials are designed from the start for eventual reuse in a subsequent production process or application. Thus the circular economy differs from an economy dependent on recycling. The former plans its production intentionally to avoid waste. By contrast, a system reliant on recycling often creates waste as an integral part of its production process in the hope that a portion of it may eventually be recycled. One of the reasons that Amsterdam and other ports are interested in nurturing a “bioeconomy” is because biomass is a bulky raw material, and the port already has terminals that handle it. These terminals are currently handling coal and oil among other cargo, but as the European economy shifts toward renewable fuels, fossil fuel cargo will ultimately be replaced at some time in the future. Amsterdam container terminals. Image by Joost J. Bakker. Lots of commodities are already being recycled in the Port of Amsterdam today, including paper, scrap metal, concrete, and tires. Both recycling and the biobased economy depend on economies of scale, and the port helps companies to concentrate large volumes of these raw materials. Thus, by diverse means, the port is trying to do its share to reduce its carbon footprint and usher in a greener and more sustainable economy. Third of a four-part series on Amsterdam’s efforts to reduce its carbon footprint and become a more sustainable city. Cyclists crossing one of Amsterdam’s many bridges. Image by Jorge Royan. 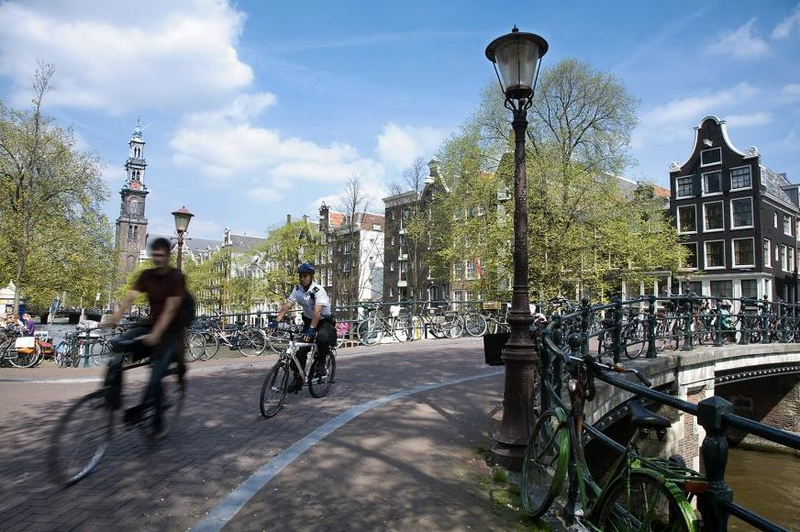 Amsterdam, The Netherlands — How did Amsterdam formulate its ambitious climate and energy planning programs, stealing a march on many other cities? During a wide-ranging interview last fall, Peter Paul Ekker, spokesman for Amsterdam Alderman Abdeluheb Choho, vice mayor for sustainability, described the city’s ambitious sustainability goals and why Amsterdam is so receptive to innovative climate-protection programs. Ekker explained to me that Amsterdam has had a municipal climate agency since 2006, long before most other cities, and that same year also embarked on its first intensive studies of climate and energy . Those studies culminated in a 2010 report, Amsterdam: A Different Energy: 2040 Energy Strategy. Over the next four years, the city council and vice-mayors led the city in creating and implementing a clean energy strategy that included goals for energy efficiency, as well as for solar and wind power. Since 2014, the city has begun to hit its stride, scaling up programs and, according to Ekker, focusing on getting results across the board while developing and refining policy instruments.To an observer, the city also appears to be blessed with good leadership. A big reason why climate mitigation has strong public support in Amsterdam, Ekker explained, is that the municipality rallies support for climate mitigation not by trying to debate the impacts of climate change or scare the public, but by calling its climate policies “sustainability measures” and underscoring their economic and public health benefits. Municipalities in Amsterdam rally support for sustainability measures by emphasizing their economic and public health benefits. Image by Edwin Van Eis. “Our analysis is that the public in general doesn’t need convincing on the need for mitigation measures, but it does need examples and solutions on how to become a sustainable economy,” Ekker said. Thus, for example, the city’s policies on electric vehicles (EVs) are not “climate change-driven,” Ekker notes. Support for those policies is borne of concern about public health. Of course, the net results benefit the climate, too. Amsterdam is also discouraging the use of inefficient fossil fuel vehicles by establishing restricted “environmental zones” from which older, less efficient vehicles are barred. “Dirty trucks, dirty cars, [and] motorcycles in the future, will not be allowed to enter the city anymore,” Ekker stated. “Public transport is going to be totally electric by 2025,” he declared. Some businesses have already opted to have their delivery trucks drive to the edge of the city using fossil fuels and then transfer to an EV because it’s cheaper to enter the city in an EV. This, Ekker believes, could be a model for other cities. 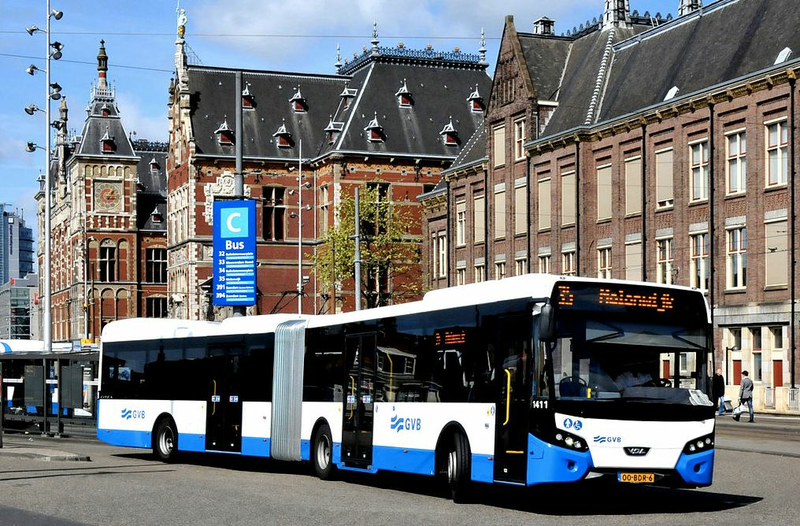 Amsterdam plans for its public transit to be emission-free by 2025. Image by Jan Oosterhuis. The city is currently changing from diesel to electric buses and has 40 electric buses on order for delivery within three years. Ultimately, all Amsterdam’s public transport will be emission-free. By 2025, all the city’s taxis will have to be electric. The city’s taxi fleet will have gradually worn out by then and been replaced by electric taxis. “Technology is coming to our aid,” Ekker observed. “In two or three years, you’re going to have a fine Tesla for $35,000 [that will be] comparable to any taxicab that you buy now.” The electric vehicle, however, will be cheaper to maintain and operate than a fuel-burning car. Amsterdam also has a subsidy program for EVs and provides five or six thousand euros to a business buying an electric van and up to €40,000 to a business buying a large, heavy electric truck. Amsterdam has a subsidy program to encourage businesses to buy an electric truck. In addition, EV owners in Amsterdam also get EV tax credits and avoid the increasingly onerous regulations being applied to fossil fuel vehicles in the city. . In fact, those with the dirtiest vehicles will not be granted city parking permits at all. Finally, fuel costs in the Netherlands and Europe are far higher than in the U.S., which makes EVs even more attractive economically. Gasoline in the Netherlands now costs $1.80 per liter ($6.80 per gallon). Cycling is a big part of Amsterdam’s clean transport story. There are more bikes than people in Amsterdam. “More and more we’re biking,” Ekker said, and the city is increasing the number of green bike ways separated from the roadway. The city has a whole set of clean energy targets. For example, it plans to increase the number of households with rooftop solar generators from 5,000 to 80,000 by 2020 while it expands the city’s wind power generating capacity from 67 MW to 85 MW. The challenge Amsterdam faces in this regard is that whereas many residents are interested in solar, relatively few have suitable roofs. 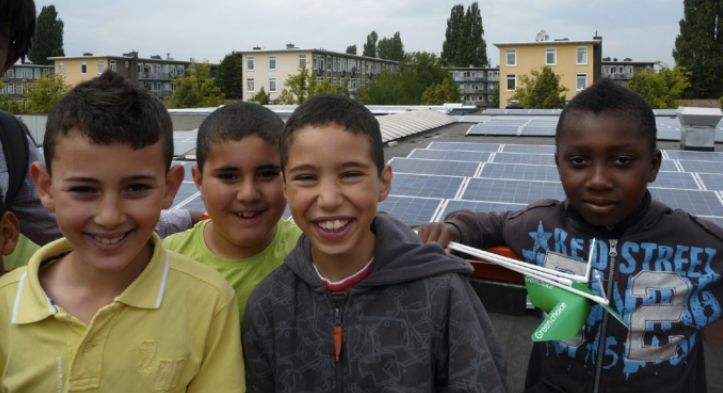 While Amsterdam does plan on increasing the number of solar generators, many residents do not have suitable roofs to install one. Image by Edwin Van Eis. Since the spring, the city has therefore been working with owners of large factory and commercial roofs to arrange for them to lease their roofs to residents for solar generation. The city has even arranged for the siting of residential solar collectors on the roof of a metro station. Amsterdam has also become a strong proponent of the “circular economy” once the city realized that it could replace a third of the building materials it used every year by recovering and reusing building materials. “But to do that,” Ekker said, “you need to build smart,” by which he means constructing buildings so they can be more easily recovered once the building has reached the end of its useful lifespan. In addition, all concrete that the city will be using in the future is going to be recycled. That will be “a huge CO2 reduction,” Ekker says. In contracting with developers for buildings in Amsterdam, 30 percent of a prospective project’s rating is based on its sustainability score. High-risk projects get loans from the city’s new €50 million sustainability fund. Amsterdam is already reusing municipal waste to co-generate heat and power for residents in northern and western Amsterdam. The waste is collected and delivered to a central incinerator with advanced pollution controls. Heat from the plant is distributed to households in large insulated pipes, replacing individual gas furnaces. 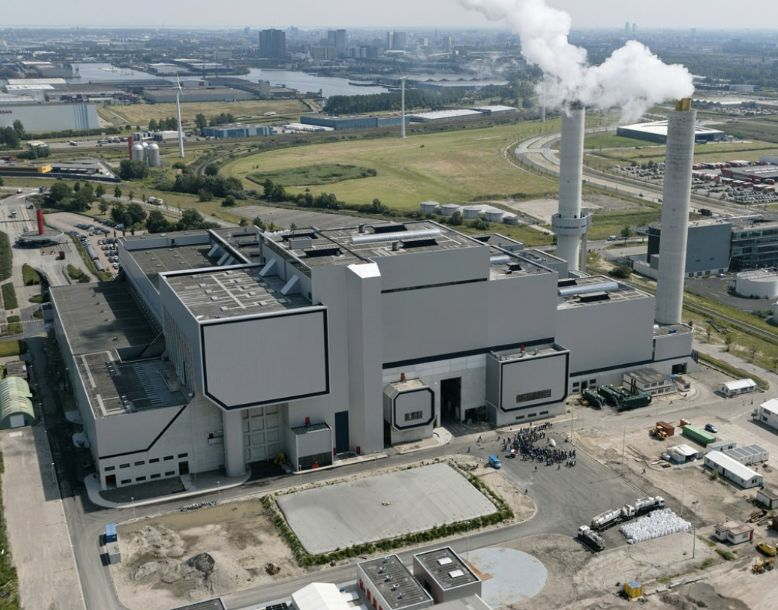 Excess heat from a gas-fired power plant on the east side of Amsterdam in Diemen serves residents in the city’s southern and eastern quadrants. Meanwhile, the city plans to create a regionwide heat network, extending from its Tata Steel smelter on the North Sea shore in Ijmuiden 25 km west of Amsterdam to the city of Almere, 25 km east of Amsterdam. All told, Amsterdam plans to have 102,000 homes on district heating by 2020 and 240,000 by 2040. Geothermal heat sources and surplus heat from urban greenhouses where flowers and vegetables are grown will provide heat to the regional heat-network.